At our three star eco-friendly Country Hotel we offer spacious rooms with private facilities. – Phone and internet access is also available upon request. We also have available a family room and a cottage. At Guesthouse Raudaskrida we offer rooms with shared bathroom and lounge with satellite TV. 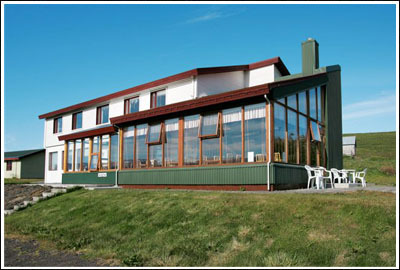 Our restaurant offers buffet breakfast and a la carté dinner, with emphasis on traditional Icelandic dishes like arctic char and lamb. We also have a fully licenced bar. For leisure we have a birdwatching hide on our property and we have some beautiful hiking/biking trails, with information about the nature and Saga´s mapped out for our guests who can make use of the hotels bikes free of charge. At the end of the day it´s also very nice to relax in our on-site hot tubs.